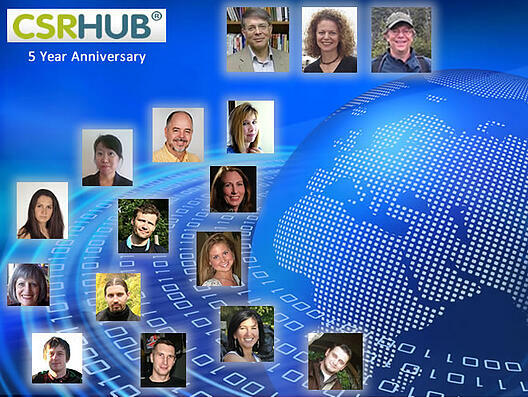 CSRHub marked the fifth anniversary since our founding. It’s a remarkable milestone, and we feel we have accomplished more than anyone thought possible when we first formed our company. Our latest “big data” set contains more than 20,000,000 data elements. They come from more than 185 sources who collectively cover all aspects of sustainability and corporate social responsibility. With our latest data release, we offer at least partial ratings on more than 6,500 companies and organizations. As we expected, we are starting to add private companies and public entities, to our long list of publicly-traded companies. We rate companies now in 70 countries. We have great coverage of the huge US market (almost 3,000 names), but also strong coverage of Asia, Southeast Asia, South Asia and the Pacific (1,700 companies), Europe (1300+) and more than a smattering now of companies in Africa (100), the Middle East (86), and South and Central America (200+). More than 20,000 people use our tool each month—a number that continues to grow between 12% and 15% per month. More than 6,000 of those people have registered on our site—making the CSRHub community one of the largest groups of sustainability professionals. In addition to providing these users subscriptions to our data, we can direct them to suppliers of reports (we directly resell more than 10,000 reports), training courses (we have four different training partners), consulting services, and software tools. Our API is being used more and more widely, as sustainability-related apps and tools developers integrate ratings metrics into their products. A team using our data recently “won” a “green Hackathon” and we try to participate in one or two events each quarter. We have more than 150 partners—and hope to keep adding new partners as new products are introduced. Our team has grown—we now have over a dozen people working with us. We hope to do our part for the economy and double the size of our team over the next year. It is satisfying to have a “team meeting” and actually have a team show up! We started with only three people and had almost no staff for our first two years. Of course, we had high hopes for our business when we launched it. However, for the first two years, we were not sure we could obtain, aggregate, and normalize enough data to build a viable product. We then didn’t know if anyone would come to our site or buy our subscriptions. And, we wondered if companies, other ratings sources, or industry pundits would see us as a threat rather than as a resource and partner. Provide data on hundreds of thousands of companies. We would like to cover all publicly-traded companies and most major private companies. If we achieve this goal, it will be possible for our clients to streamline their supply chain reviews by using our tool to predict where their “hotspots” may be. Encourage and support a wide range of consumer and small business sustainability tools. We hope that developers will use our data to help consumers buy “positive” goods, select jobs with companies that have a good CSR reputation, and discover groups and activities that will raise their awareness of social issues. We believe we can also enable the development of software tools that will encourage small businesses to launch sustainability programs that emulate those many larger companies have already created. Enable fact-based decision-making by sustainability professionals. We hope that our consulting partners will use our tool to better understand and describe “best practices” for achieving sustainability goals. They can then help their clients design more effective strategies for achieving sustainability. By helping our partners and customers track their progress, we will encourage clear goal setting and increased accountability for CSR activities. Our goal five years ago was to increase the transparency and availability of corporate social responsibility information. Our goal was ambitious and, as is true for most “mission-driven” organizations, we will probably never fully achieve it. However, we’ve made progress and we have a clearer idea now of where we can be useful in the future, than we did five years ago. We are grateful and thank our customers, our team, our investors, and all of our partners. You have made our success to date possible and will be integral to our success in the future. CSRHub provides access to corporate social responsibility and sustainability ratings and information on nearly 6,500 companies from 135 industries in 70 countries. By aggregating and normalizing the information from over 185 data sources, CSRHub has created a broad, consistent rating system and a searchable database that links millions of rating elements back to their source. Managers, researchers and activists use CSRHub to benchmark company performance, learn how stakeholders evaluate company CSR practices and seek ways to change the world.